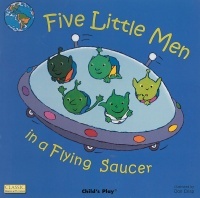 When five little men come to visit Earth from Outer Space, they don’t like what they see. Finding a planet that is spoiled and neglected, the little men fly away, one by one. Luckily, by the end of this much-loved counting song, the world becomes a better place to visit - and the five little men may even have had something to do with it! All children love this traditional rhyme and singing along will help to develop number skills. Bouncy illustrations, innovative die cutting and popular rhymes make Books with Holes a must for every child. Available in three formats, suitable for babies, toddlers, pre-schoolers and the nursery or classroom.